Finding the perfect sized leather holster is no easy trick. Sometimes you may think the sizes match, but after inserting your gun, you may realize it fits too snug. What now? If this happens to you, you should simply break in or stretch your leather holster. When you do you’ll see your firearm slides in and out smoother. 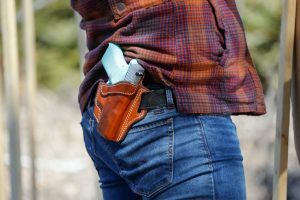 Why Are Leather Holsters Tight? If you find your leather holster to be tight, don’t think you received one that was poorly made. 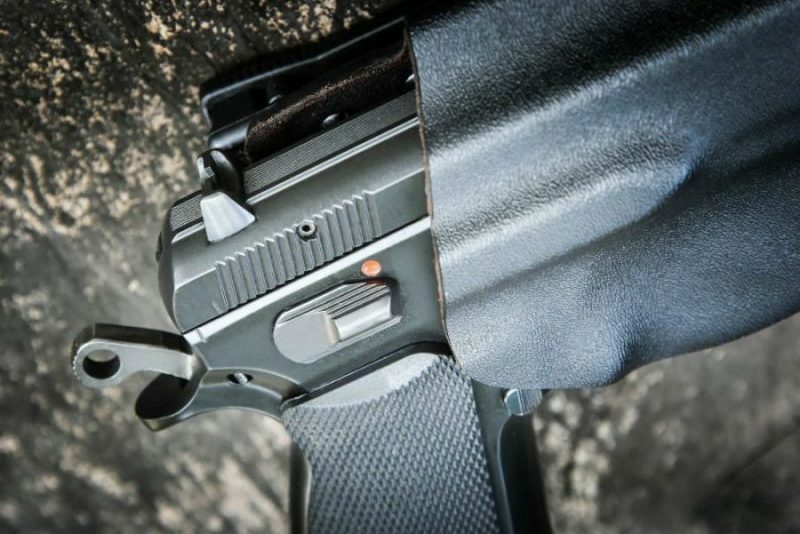 Generally leather holsters are tighter than those made from Kydex, neoprene and other materials. Leather holsters are manufactured through a technique called the wet molding process. A mold of the gun is created and then it’s inserted into a wet (leather) holster. 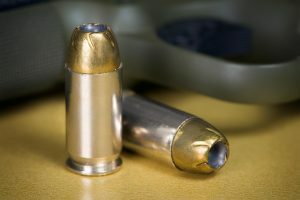 The manufacturer uses pressure to capture the shape and contour of the gun. It’s natural for leather to shrink resulting in a tighter holster for your gun. There are two reasons why you must break in the leather. 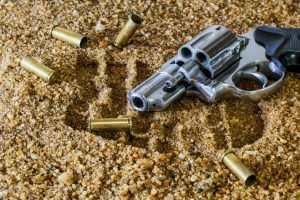 Can you imagine yourself in a predicament where you need to draw your gun in a hurry? 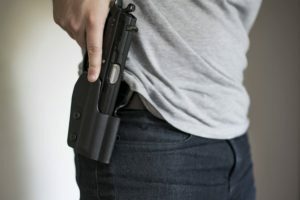 If the holster is too tight you may find it difficult to remove your gun. You need as much time as possible to protect yourself and others around you. This type of struggle takes time away and it may give the assailant the advantage. This is essentially the main reason why stretching the leather is important. You may think buying a leather holster protects the gun’s finish. This can be true or false depending on whether the leather is stretched or not. If you haven’t stretched the leather, it can cause unnecessary wear on the gun. Unstretched leather hugs the gun tighter and it causes more friction when you continuously remove and insert the gun. It doesn’t scratch the gun, but it does remove the protective finish. 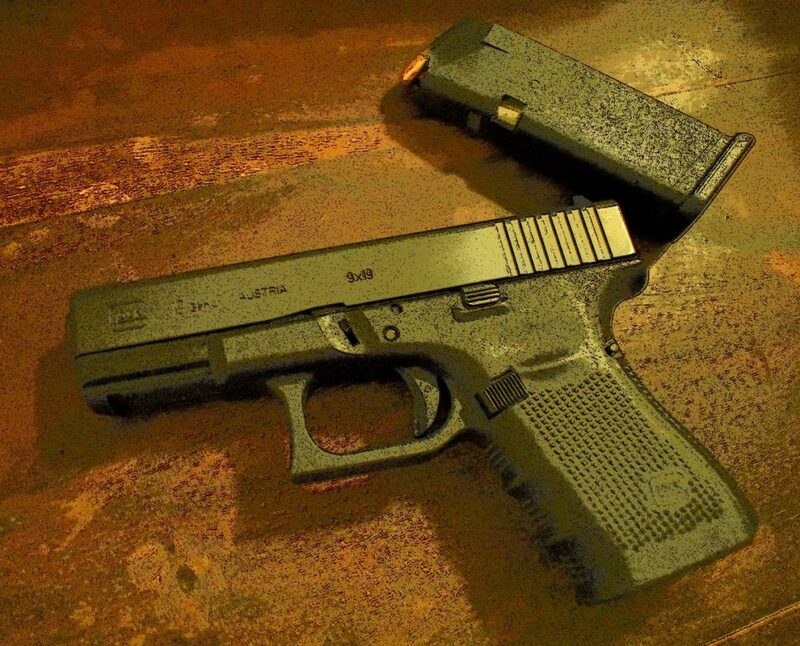 Most guns have a non-reflective finish for a more discrete look. If this rubs away, it can create a shine which can make you noticeable during combat missions. Stretched leather doesn’t rub against the gun roughly, and it maintains the look of it for longer. There are four ways you can stretch a leather holster. 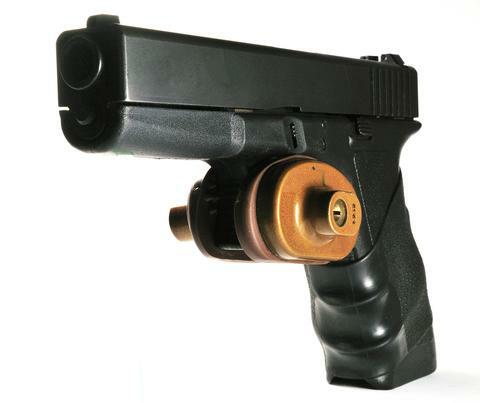 This is the simplest way to get your gun to fit better. If your gun has tension screws just loosen them according to your preference. 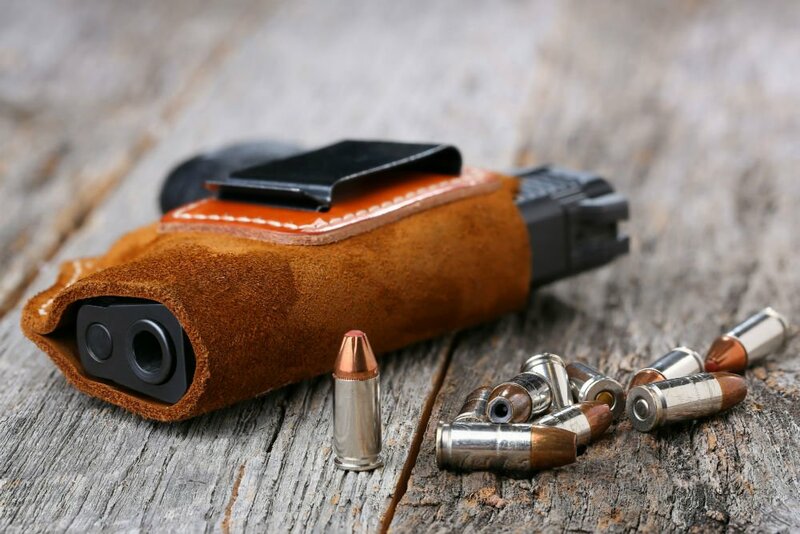 This way, your gun can slide in smoother and there won’t be a need to stretch the leather. With time, leather does tend to stretch because of wear and tear. This step is great if your gun doesn’t have a tension screw or it doesn’t loosen it to your needs. When you wrap it, leave only the handle exposed for you to have a firm grip when you insert the firearm. Insert the gun and give it a few twists to help expand the leather. 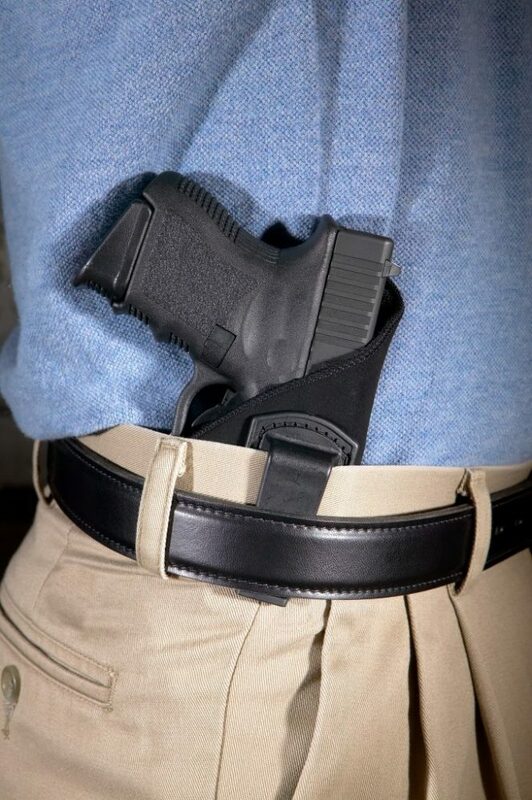 Leave the holster in this position overnight. The next day remove the gun from the holster and the wrapping. Insert only the gun back in the holster. At this point it may feel looser and easier to draw and insert. If it doesn’t live up to your expectations yet, repeat the process. The retention strap also contributes to the gun not fitting in the holster. When you stretch the leather, you may also want to do the same to the tension strap. 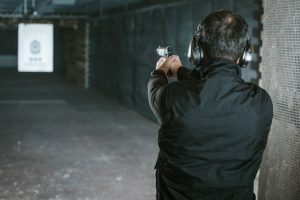 If you don’t it may be difficult to close the holster while the gun is inserted. 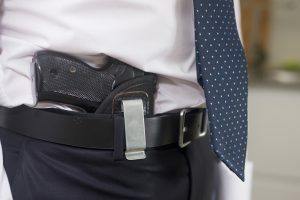 Loosen the strap by holding it and pull on it while you put the firearm in the holster. You can also twist the strap as you pull it. Leave it like this overnight and this will break in the leather. When the strap is stretched, your gun can properly sit in the holster. As mentioned before leather can stretch due to wear and tear. You can speed up the process by applying lubricant on the holster such as Draw-EZ. Apply it sparingly, so the leather doesn’t slacken beyond the point where it’ll be too big for your gun. Do you see how easy it is to stretch a leather holster? Now when you buy yours, you can make it fit perfectly. You can now look forward to smoother gun handling, which helps you stay responsive in emergencies. Drops us a line below and let us know what you think!